To master painting tools I research many websites and I saw some written by people who are obviously not professional painters. 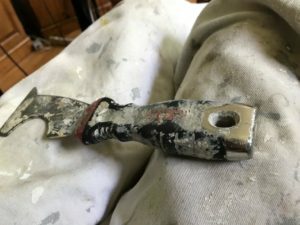 We all know the necessity for the right paint tool for the job (read on Architecture.com ). No, duct tape is not the best painting tool for every paint job! 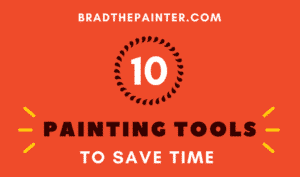 We will start with a few time-saving painting tools, followed by my list of the best painting tools that you really do need, and then a few extras paint tools that will make the paint job a lot easier. Wide rollers: We use these for big long walls. 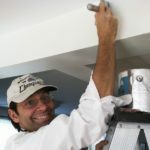 They require a special bucketand 18-inch roller sleeve—a medium nap is a good length— but they are worth the investment if you do a lot of painting: you will literally go twice as fast. Mostly pro with one con: you cannot roll right into a corner. Meh. Clean by soaking in water in the bucket: not hard. Keep the bucket clean: as with all pans/buckets, don’t let paint chips fall into the paint. (If they do, use an old nylon sock to strain paint!). Extension Poles: we use two sizes and then we have a shortie for tight spots. We use the quick-lock type, which is not compatible with the threaded types. The screw-threads tend to loosen with motion. Our recommendation comes with a converter tip for both! It’s all in the telescoping: you don’t have to change poles much. I’d recommend a 6-12 and a 2-4. Don’t go very big as they bend at full extension: use a ladder for that. 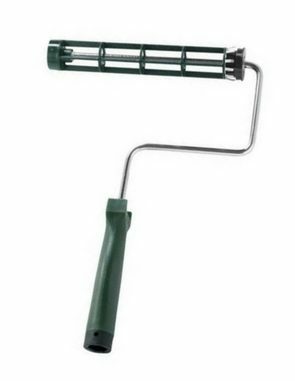 Ceiling Scraper (popcorn remover): Hate that popcorn ceiling? Knock it off with this. We have an entire post just featuring 3 sprayers for 3 budgets. The best non-commercial paint sprayer today is hands down the Graco Pro 210 ES. It’s pricey but will last a lifetime with proper care. The Magnum line costs less but is nothing like the ‘Pro’. If you spray: pick up a hand-masker —it’s a tape/paper dispenser. This 4-minute video shows how to use it: you just need a roll of paper and masking tape . You can also use masking film and a special masker blade. Remember that tan masking tape leaves a mark after a few hours (cheap glues). We use the blue stuff for more delicate surfaces. (We use it all over the house too.) This masking method is good for protecting window sills etc under a roller as well. Ladders are fine but the hassle of moving them a lot vanishes with a platform. Ah, a platform. Better yet, try this rolling scaffold which I own. I wrote a more detailed article on the best ladder for every budget. We have compared the paint tools below and you will find our picks for the best painting tools deals around. Wooster is my choice (Purdy is great too), and it is really the best paint roller frame (cage). The ones in kits break easily. Advanced tip: the pros use moderately priced paint tools. Try the Quick Lock type (special pole required). It is a snap system, (that also accepts a screw-in pole), and to use the snap you have to have the snap type pole. But don’t freak. It’s so worth it. We use them because we can remove poles and re-attach a different length pole quickly. We use wool or a wool/poly blend. 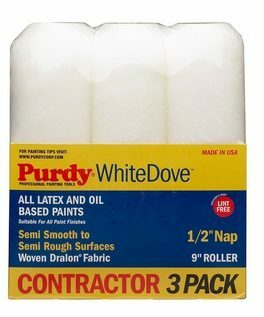 The Purdy is my choice—it’s the best paint roller cover, and online a very good deal. A half inch nap is good for most interior work: but not stucco or popcorn ceilings. They don’t shed and leave ticks on your wall like the low cost ones and they hold a lot of paint so you can go farther with each dip. 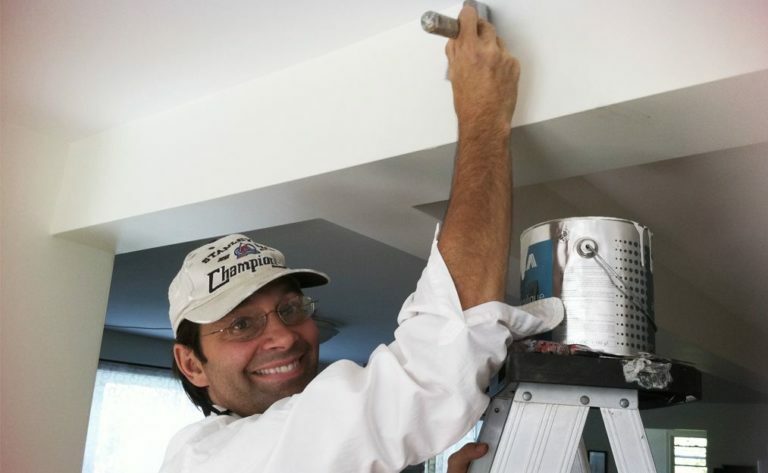 TIP: A free wall painting tool to store a wet paint roller overnight or even for a few days: you just use a plastic bag and put a few drops of water inside! We try to re-use everything. We do not use brushes for ‘all paints’: the bristles don’t behave well. B00002N8YQ [/asa2 Actually we sometimes buy a dollar store paint brush to leave in a small can of primer or to use with some oil paint. We don’t clean brushes for icky paints. A Purdy is a lifetime painting tool: and it’s easier to clean than you’d think. 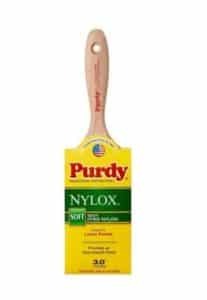 Usually, a good Purdy is $20 for one so here is a very good deal on 3 brushes (for ‘all paints’ so they are ok for latex, but not as good as the Nylox above.. In general, we use an angle cut brush for everything as a flat cut brush does not work as well in corners. But this pack contains a variety of sizes most do-it-yourself-ers prefer. (We pros go for the 3 or 3.5-inch brush as it holds more paint: save time with less dipping). Read more about the best painting brushes that I recommend. This is my personal assistant: a 5-in-1 “putty knife-can opener-nail puller-hammer-roller squeegee-scraper(s)”. You need the metal hammer end: important to have, as well as the nail puller hole in the middle. It’s like having a 3rd hand. Keep in the side pocket of your…painter’s pants. Our pants have a nice side pocket just for a putty knife (read more about painters pants). Be careful with the sharp point on this knife when in the side pocket: I put a hole in my car upholstery. Once I knew a librarian who could not think without a pencil in her hand. I cannot work without my 5 in 1 tool in my side pocket. I also need coffee. Essential in its own way. Our favorite pole is part of a locking system: you’ll never go back. Used for threaded type roller also. A broom pole unscrewed WILL work, but are flimsy. Some bathroom plungers will fit also for a short pole. If you get an adjustable fiberglass or aluminum pole, you’ll be happier. Also, check out the Sherlock system here. Have some various grits around: 120 -150 – and some 80. Careful with the 80 as it can do some damage. Buy the good stuff and don’t let it get wet! Or go with a sanding sponge, the kind you can wet to cut through plaster faster: but I don’t like them. Just a block of wood that you can wrap sandpaper around will save your hands some stress. You can buy the kind that has a clip so the sandpaper does not move around. 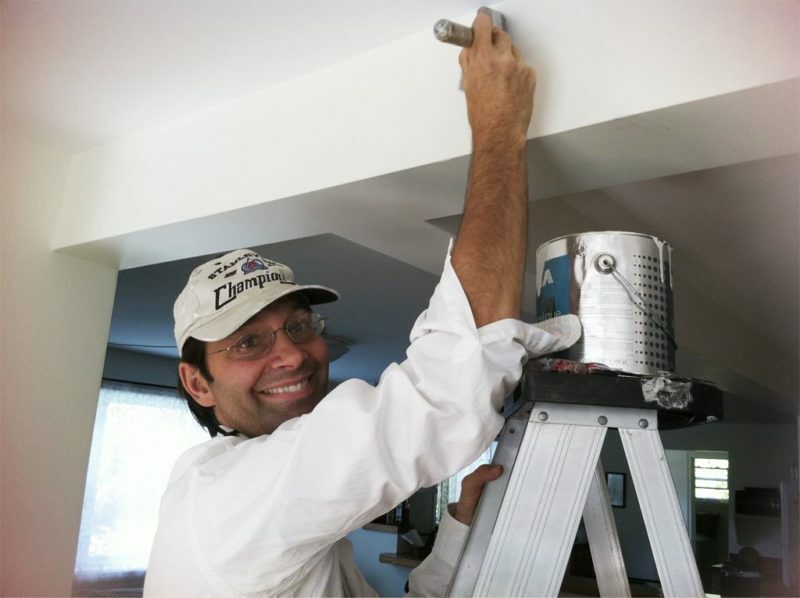 Remember to give walls a quick blast with about 120-150 grit sandpaper to remove ticks and lint trapped there from the last painter who used a brush-roller kit that shed lint~! I prefer this roller bucket at Home Depot. If you want a tray, that one as a lid, but we use 5-gallon buckets that paint comes in and knock off excess paint with this screen. This system is so much better than a tray/pan. It is is hard to spill–we use a plastic bag for an overnight lid. It is made out of durable plastic and balances a lot better than a paint tray and washes out easy. 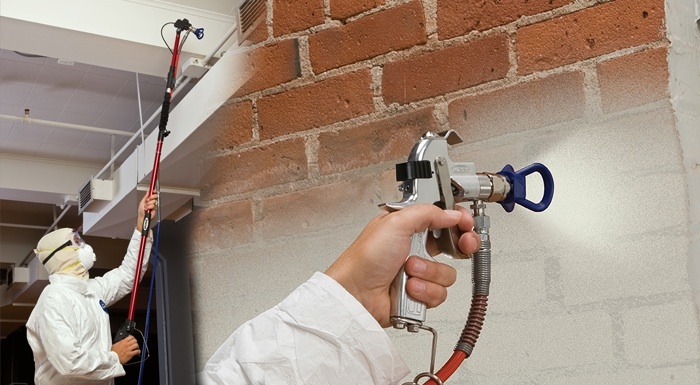 It’s a must-have wall painting tool. We use these mini-rollers to paint behind toilets and radiators etc.—in any kind of tight spot. Read more about how to paint behind a toilet here. If you cannot borrow your neighbor’s ladder, get a quality 12-foot extension for around the house or 24-footer if you are brave. I personally would not go up a ladder bigger than 24 feet (not counting my reckless youth). You will use it outside and inside for painting stairwells. Don’t store outside as the rope will degrade quickly. I have the one linked here, as well as a 24-footer and others. More about ladders for every budget here. Oh baby, how I love this ladder. It has a shelf for tools and the ‘cut’ bucket, and I customized it by adding a thick screw to the top handle for hanging the cut bucket as it is up higher. We move fast and this was a big help for us. I did not invent it, but I perfected it! See photo. That hook should be patented! Good to have around while painting. We use canvas tarps for floors, plastic for furniture. Not expensive and it has many uses. Tip: wipe up drips that go on the plastic and cloth so you do not step in one and track paint when you step off onto the floor! are best for walls: only 4′ wide. We also use heavy duty stuff: it is very thick plastic. Nice. HANDY: Drop cloths with grip. Once pressure is applied, the rubber dots grab and hold firm. You can see the different sizes here. Good lighting will help you catch the ‘skips’ in the paint. I consider this one of my main painting tools. Anything you miss with good lighting will never be visible in normal light later. We used to use halogen which is very hot and have bulbs that wear out or break. LED’s go forever. Quick Dry Spackle is a somewhat new invention. Keep the lid tight! The old trusty putty knife is better than a 5-in-1 for getting a nice patch. For larger repairs, have some pre-mixed drywall compound handy: it dries slowly, but is easy to sand unlike the quick dry! You’ll need wide taping knives to apply. I am using this one—my secret love. We have 3 posts on caulking, but this post is just on the guns. Guns made in ‘low-cost’ countries (you know what I mean) frustrate you by pushing out caulk even after you click the tension rod off. What you need is moderate quality and it needs to have a cutting tool to cut the tip off the new tube, and a poker to break the seal inside the spout of the tube. You can carry around a knife and a nail like we had to do before they got smart and built them into the gun—what a drag man. This hand masker kit is what we use to prevent splatter on floors etc: please watch the video to understand how to use it. It’s a big time saver. But you should have more tape and this paper on hand: we keep wide paper and narrow paper in the shop. We like colored rags as drop cloths are generally white and white rags disappear when dropped. Caution with colored rags: the pigment may come out when you wipe. An old baby diaper or any flannel is best. Keep a damp one in your side rag-loop (the loop in painters’ pants is not for a hammer!). Yes, you can buy ’em. I love my Purdy wire brush. For prep of iron rails? Yes, but to remove dried paint from the outside of your paintbrush is the main use of a wire brush. Cleaning a brush is actually easy. We use this comb is for straightening the bristles to let the brush dry well. Martha Stewart is wrong about this. Her website shows, to clean under water! Funny self-taught websites! Finally, to spin a roller cover dry (a few dunks and a few spins and presto), this brush/roller spinner can do brushes too but we just use it for rollers. See my post on cleaning roller covers and our post all about why you should only buy the best roller covers. Get yourself a good screwgun— really an electric screwdriver—and this is a great drill. What is a screwdriver? It’s a hand tool we used to use before fire was discovered. I might still have some. But seriously, read our full post on screw guns for every budget and all the accessories you can wish for. Still, there is no substitute for a corded electric drill: real power on the job site. We buy Neon carpenter’s pencils: the lead never breaks! We have a post all about primers but the bottom line, for ink, water stains etc, is to use the one sure thing: Kilz. IF you are not sure if you will have enough stain blocking power…BIN has a powerful shellac stain blocker spray (comes as liquid also), but please wear a respirator for BIN. Also, 1-2-3 is awesome for tough stains . Tip: Cut down the handle on an old brush and keep it inside the primer can with the lid tight: always have it ready for stains. Be sure to wear gloves! Use Zinsser Mold Primer if you have a mold problem. We have a whole new post on how to paint over a mold problem. Not just painting tools, I use some of these every day. You can do without them for occasional house painting, but they are good professional painters tools and can make your life much easier. Work gloves – Not for heavy duty work, but for painting: I cut off the fingertips. Keeps hands clean and protected from cuts etc. Latex gloves are here. Shop Vac– I keep a wet-dry vac around all the time. Once I dropped a quart of paint on a lady’s carpet….yes at quitting time! Rushed out to get the vac. With adding warm water to the mess and going over and over, I left a bit spot much cleaner than the rest of the carpet! Respirator. This is the link for the mask only then, add these filters: a chemical cartridge, or do what I do and buy the kit. The kit has 3 things: the main filter (linked seperately above as well), the outer paper filter (makes the inner filter last a very long time) and it comes with the retaining clip to join them. It’s necessary for spraying or using oil/toxic paints and many other toxins. You have to read what each filter does if you are around deadly gasses. It is not really expensive, and to us, health and safety really must be first. Learn more about the type of filters and how to use them in our post about respirator masks. Tack cloth – For when you need to really remove all dust/lint. This is more for furniture painting, but good for eye-level and hand-level door frames, especially around the door knobs. Sponge – for cleaning walls before painting (after sanding especially). I keep one semi-damp on hand. Powerful Fan – Keeps you cool as well as helps dry the paint faster. We have several. 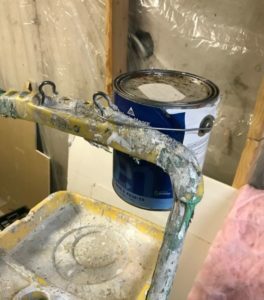 Cut Bucket (for brushing) – We just use the single gallon cans and here is a good tip: use a regular can opener to remove the lip that holds the lid. We usually buy several gallons of the same color, and keep one can nice for storage (that means we don’t gunk up the seal with paint: we wipe it clean with brush). You can buy 2-quart or 1-gallon buckets that come with lids: great for storage too. Painter’s Pants – they have great pockets. I like the kind with a cell phone pocket and for pants that don’t have that, I sew a pocket onto the front of the thigh. We have a post all about these. 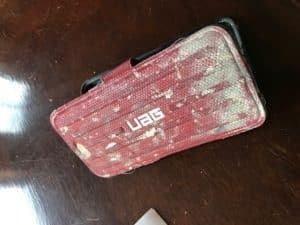 A cell phone pouch to protect phone’s openings from dust and paint. I was given the cover in the photo which goes in a pouch. Love it. iPhone 6plus case after 1 year: still clean as new! Tool Pouch – I have lots of pouches on my belt for all kinds of painters tools: I hate to go hunting for a tool. Tool Bucket – A good place to keep things together. You also need the actual bucket! This bucket holster is what we use to gather all painting tools every so often and you won’t have to hunt them down when you need them. That is a momentum killer. Let me know what are your best painting tools. I am a semi-retired painter, sure, but I still love and care for my house painting tools. Any home maintenance task that needs to be done, I hook up my tool belt and I have everything that I need right on my person. After I paint a room or a wall, I always make sure to clean my tools. Painting tools are not just good for painting! I use my 5-in-1 knife all over; it’s a screwdriver, it cleans goo of the kitchen floor, on and on. Write us and let us know what you think. 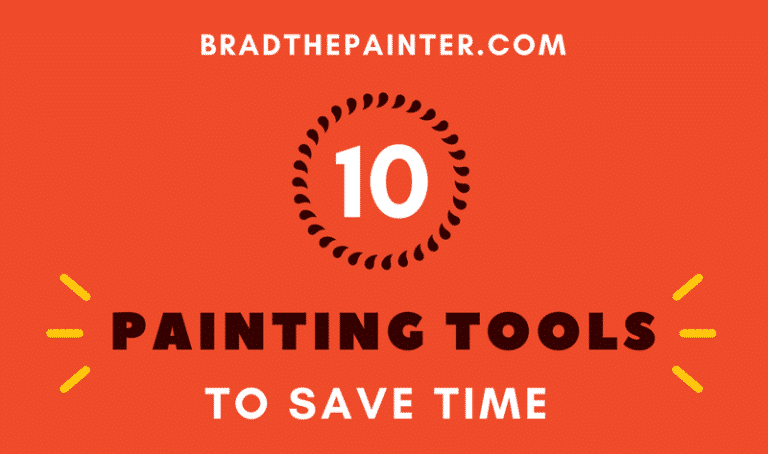 Are you convinced to buy the best painting tools for your home, or will you go with cheap working tools and throw them away? Your site great for us DIYers. I am going to paint our whole house this summer. 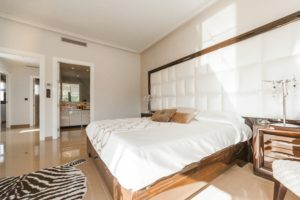 Your tips on buying the best quality paint and rollers is great and makes sense. I would normally buy Valspar but have a coupon for 40% off at SW. Even if I didn’t have the coupon I was going to buy SW after reading what you say about buying a good paint. I have been thinking of hiring someone to paint the house for one reason. I have stained chair rails and baseboard throughout the house. I replaced it after the last time I painted so it looks nice and am concerned about how to not get paint on them. I tried taping the old ones in the past but it never seemed to do a great job. Your recommendation of the Purdy brush and how the bristles fall in to the corner gives some hope I may be able to cut it in. I just haven’t done it before and there is A LOT of it to do. Can you recommend a way to practice doing it before I start on the walls? One other thing, I am painting a wall red from a light yellow. So primer huh? Thanks for your hard work on your site. It is very much appreciated. Thanks for the nice words. Yes we work hard! I enjoy my work and the others helping do also. So it’s simple I think, but I have not seen it. Caulk. Use a very thin bead of PAINT-ABLE clear caulk. With a good brush, the bristles will find the corner and give you a straight line. The clear will ride up on the stained rail somewhat if you are ok with that. Yes, practice. If you have time, work on some scrap, esp with caulk. It takes a touch. Read the caulk posts we have: we have one just on caulk types.